This traditional Easter treat, based on an early Victorian recipe, is classically decorated with 11 toasted marzipan balls. 1. Start the cake the night before you want to bake. In a large bowl, mix together the dried fruit, glacé cherries, stem ginger, spices, Amaretto and citrus zest and juices; cover and set aside to soak overnight. 2. The next day, grease and line the base and sides of a 20cm, loose-bottomed cake tin. Roll out 190g marzipan to a disc slightly smaller than the tin, about 0.5cm thick. Roll the remaining marzipan into 11 even balls (about 10g each) and place on a baking tray; set aside. 3. Preheat the oven to 150˚C, gas mark 2. Using electric beaters, cream the butter and sugar in a large bowl until lightand fluffy. Gradually beat in the eggs, followed by the ground almonds, thenfold in the flour, soaked fruit and anyjuices until mixed. 4. Spoon ½ the mixture into the tin, level the surface and place the marzipan disc on top. Spoon over the remaining cake mixture and level the surface again. Bake on the middle shelf for about 2 hours 30 minutes, or until firm to touch and a skewer inserted into the centre comes out clean; cover with foil for the final 45 minutes if it browns too quickly. Leave in the tin for 15 minutes, then remove and leave to cool completely on a wire rack. 5. Meanwhile, lightly toast the marzipan balls under a hot grill (about 250˚C) for about 2 minutes; set aside to cool. Place the cake on a plate or stand, and warm the apricot jam in a small pan. 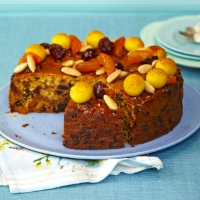 Brush the jam over the cake and decorate with the marzipan balls, toasted almonds and additional dried fruit and stem ginger, glazing with any leftover jam.